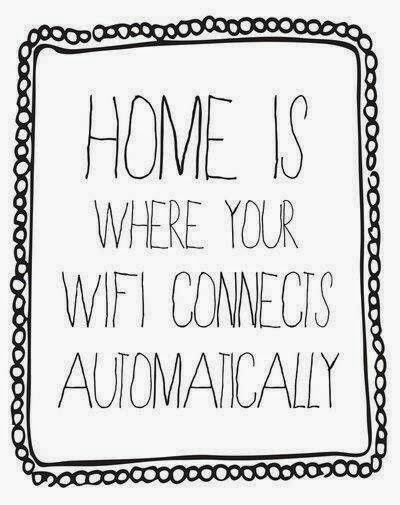 Dear El + Em: Oh, Wi-Fi...I've Missed You! It took WAY longer than expected it should have for cable and internet at the new house! Let's just say Comcast is NOT my friend. This image makes me laugh because I can totally relate. Duh, I missed having internet for obvious reasons but in all seriousness it seems much more "homey" in here now that we are connected. There's something very unsettling about not having internet. Truthfully, there hasn't been much time to sit around on the computer anyway. Every free second at home that isn't devoted to Ella has been spent unpacking and trying to get somewhat organized. Data on our phones was LOW, so that was hardly an option. This was an eye opening experience that made me realize how unnecessarily dependent we are on technology. I'm not going to lie though, it was so nice to be able to Facetime with our parents today and give them a tour of the house! It's good to be back! When we moved to Georgia, we set up our Internet before our air conditioning was fixed. The apartment was 87 degrees, but we had Wi-Fi. yay to internet!! It goes down at my work and i sit there not knowing what on earth to do haha!